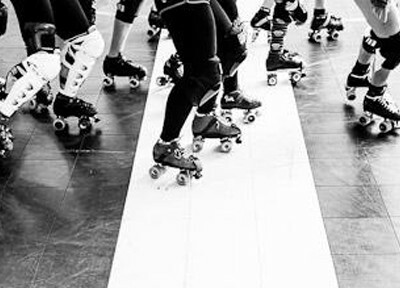 Why does it make sense to have a standardized fitness test for roller derby? Most major sports have a benchmark indicator of the elements of fitness necessary to be successful in the sport. These tests, like the NFL Combine, are used most visibly for scouting and drafting purposes; but younger and up-and-coming athletes also have the benefit of using these tests for self-monitoring, tracking and development. Coaches and teams benefit from identifying individual and group weaknesses and modifying training focus accordingly. Roller derby athletes, on the other hand, currently have little framework for comparison of fitness levels. 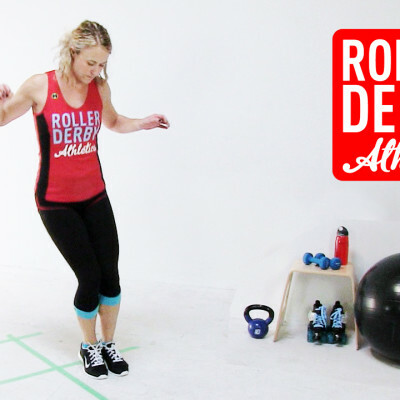 The RDA Standardized Roller Derby Fitness Test attempts to create a unified standard that can be used by individual athletes, and by teams and leagues worldwide. Anonymous results (leaderboard and averages) will be posted on this site for reference and benchmarking (see below!). Already took the test? Enter your results here. Scroll down for an up to date summary of global results to compare your scores to. NOTE: this test was originally posted on June 19, 2014, and updated on 27 October, 2014. Links to the previous version 2.0 test video and results form are at the bottom of this post. The test doesn’t test for flexibility due to the complexity of doing so, and lack of existing flexibility benchmarks meeting the above criteria. Perform all exercises with good form! Get a friend or coach to help, watch yourself in a mirror, etc. Do your best! Only compete against yourself. Do also record and save your results for your own future reference. Re-do the test at the end of a training program, or about every 3 to 4 months to monitor your own progress. SELECTED BECAUSE: the cadence serves to minimize faulty results seen in AMRAP tests for pushups where athletes use poor form to complete push-ups very quickly. THE TEST: Begin in push-up position – feet together, hands slightly wider than shoulder width, a straight body line from heels to the crown of the head. Lower into the push-up position, upper arms parallel to the floor, a 90 degree bend in the elbows, maintaining a straight back. Return to the starting position. Have a friend monitor your pushup depth with his or her hand to ensure you lower to the required depth each time. Count your reps as you perform push-ups in time with the cadence of the metronome at 40 beeps per minute: 2 beats = 1 pushup = 3 seconds. This translates to 20 push-ups per minute. The beep at the bottom of the movement is for guidance only – you may descend more quickly or more slowly if you wish. Your test is complete when you have quit or can no longer maintain the cadence for 3 reps in a row. Those last 3 reps do not count for your score. MODIFICATION: If you are unable to perform at least 7 full push-ups, attempt the test using push-ups from the knees. Perform the entire test either from toes or from knees – do not mix techniques in a single test. DO: hit 90 degrees with your elbows; do push-ups from your knees if needed. SELECTED BECAUSE: it is simple to perform, requiring minimal space compared to other standard agility tests. It may also reveal left/right imbalances. THE TEST: Mark out the test quadrants on the floor as shown in the image and on the video. Begin on the whistle with feet together outside the back left quadrant. Jump into quadrant 1 with both feet, then 2, 3, 4, etc. continuously in a clockwise direction for 10 seconds, as quickly as possible. Count your total number of quadrants (note: a full circuit counts as 4, not as 1). Repeat the test in the counterclockwise direction, this time beginning behind quadrant 4 at the whistle. Note to coaches – you can set up several quadrants to test multiple people simultaneously if you have a large group. Athletes can pair up to count each others’ tests with a single start/stop whistle for all from the coach. DO: keep your feet together, core strong, arms quiet and controlled. DONʼT: step on the lines! SCORE: Maximum quadrants hit in 10 seconds (note: a full circuit counts as 4, not as 1) Subtract a penalty of 0.5 for each time you step on the lines. Your total score is the numerical average (mean) of your clockwise and counter-clockwise scores. SELECTED BECAUSE: it is simple to perform and measure, and is a very widely used standard test. THE TEST: Tape your measuring device to the wall – ensure the top will exceed your highest jumping vertical reach height. Stand next to the wall, feet flat. Reach up with the arm closest to the wall with relaxed shoulders to measure your standing reach height against the measuring tape. Take a small step away from the wall if desired. From standing, bend your knees and jump as high as you can, aiming to touch the measuring tape with your wall-side hand at the topmost point of your leap. Perform three attempts, and take your best score. To measure, a friend or coach can stand on a chair to record the standing and jumping reach measurements. If you are performing the test on your own, use a piece of chalk in your wall-side hand to mark the wall instead. DO: bend into a deep squat before the leap. The faster you descend, the faster you will rebound and the higher your leap will be. DONʼT: take a running start or step before the leap. SCORE: Your net vertical leap is the difference between the standing reach and leap reach measurements. Record your score in fractional inches, e.g. 14.75. Take your best score of three attempts. To convert from cm to inches, divide by 2.54. Note: do not measure your total jump reach from the floor, e.g. 92″. Measure the difference only. Values should be between 4″ – 36″. SELECTED BECAUSE: it is simple to perform and measure, many athletes can test simultaneously with observers. The current staged plank test has superseded the previous test which was based on the 7-Stage Abdominal Strength Test described by Top End Sports. This swap was made in response to further review with medical professionals, and feedback from athletes. YOU NEED: A mat (optional), a stopwatch. THE TEST: Sustain a plank position, with set variations, for as long as possible. 0:00 – 0:59: regular, all-fours plank, from the elbows. After 4 minutes you will start again (without resting) with one minute of standard plank, and follow through the stages in order for as long as you can maintain. Stop the test and record your time when either you lose balance and fall out of the plank, or you cannot continue with good form. DONʼT: let your hips rise up, or sag down. SCORE: Your score is your total elapsed time. SELECTED BECAUSE: it has no special equipment or space requirements, can be performed at home, movements are relevant to roller derby. THE TEST: Time challenge. Perform all reps and all rounds as quickly as possible, while maintaining optimal form. All rep counts above are total, not per side. For example, 20 skater strides will be 10 per side. Squat thrusts – ensure a full 90 degree squat in both the downward and upward portions of the motion. SCORE: total time elapsed for all 3 rounds without breaks in between. Record your results for your own use. Enter your results in the global database so that all athletes can compare themselves to other skaters from around the world! Enter your results here. Results entered will be completely anonymous, and you will not be added to any email lists. FEEDBACK AND IMPROVEMENTS: I would love to hear your feedback! Technical issues, suggestions, concerns, and collaboration welcome! In particular, I am in search of a statistician who can help normalize the 5 individual test scores into an overall numerical score, and someone with coding expertise to help automate the publication of anonymous global results (averages and leading scores). Please use the contact form on the About page to get in touch! Way to go, Poizen! Don’t forget to also enter your results at the link in the post so that they can be added to global averages! Whew!!! Pain is weakness leaving the body! That was intense! Definitely know my weak area. I was shaking from the moment I got into the plank lol. Great work! Don’t forget to add your results to the submission form linked to in the article! Hi Booty! Is there a time minimum/maximum between each test?